We collaborate mainly with scientists and research institutes. Among others, we assemble addresses, lists of pests, and scientific literature. 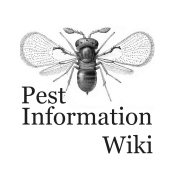 The ISPI Pest Information Wiki is the main activity of ISPI. It is used by scientists and pest management professionals and provides information on pests, diseases and weeds. For example, pests are linked to publication lists which can be sorted by year, research topic, countries/regions, host plants or natural enemies. We welcome contributions to this wiki (please register first before entering data).